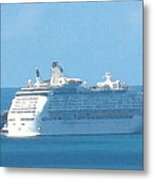 Cruiseship At Dockyard Bermuda is a photograph by Ian MacDonald which was uploaded on October 5th, 2010. This photograph was taken from the Gibbs Hill Lighthouse. The ship was at least four miles away. It was docked at DockYard on the extreme West end of the island. 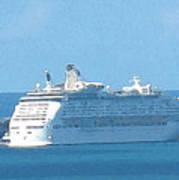 To get into this harbour the boats need a pilot to take them through the miles of coral reefs that surround Bermuda. It is the most northerly coral island in the world. There is a high speed ferry boat that takes passengers from Dockyard to downtown Hamilton Bermuda in about 20 minutes, otherwise you take a bus that takes over an hour. 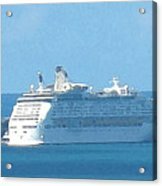 There are no comments for Cruiseship At Dockyard Bermuda. Click here to post the first comment.